Carrot is suitable for eating root vegetable. Carrot contains a very complete nutrition to provide our body the essential enzymes, vitamins and minerals. The best thing of carrot is that it is easily assimilated by our body. It is good for the health of spleen and stomach. It is also impotence sexual dysfunction, night blindness, long term cough besides strengthening kidney and eliminating excessive wind and cold in our body. Carrot has proved its outstanding role in anti-cancer effect. Carrot contains bulk of folic acid, a group of vitamin B, which has good effect to fight against free radicals in our body. 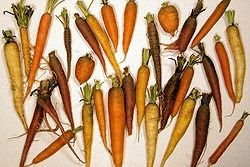 Drink 100ml of fresh organic carrot juices everyday and it should be two servings per day. The therapy should proceed constantly for 30 days. Drink 80ml of Carrot juice daily in morning and in night but Dip a drop of olive oil into the glass, mix suitable amount of royal jelly honey. Take 250gram of fresh organic carrots. Put two tablespoons of olive oil in the pan. Fry with slow fire till it is thoroughly cooked. It should be one serving for a day. The therapy should proceed constantly for 7 days.